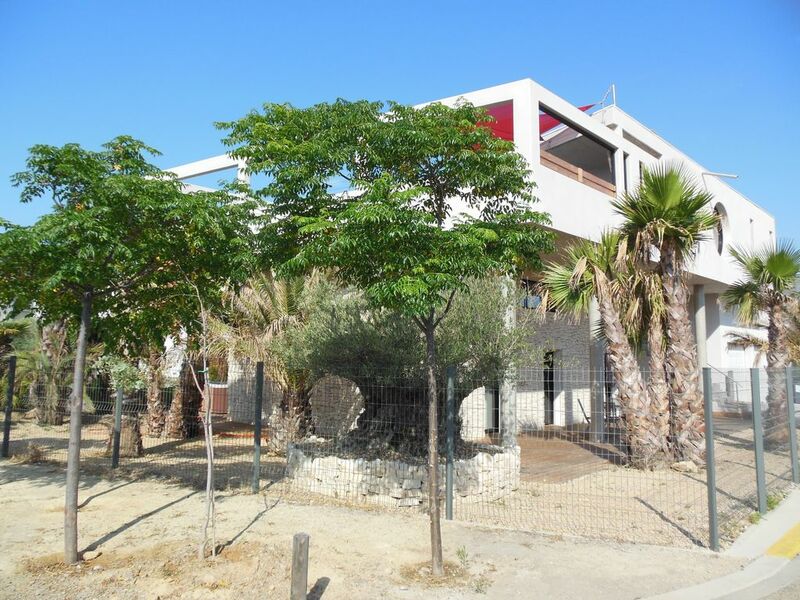 New: Sete 34200, comfortable villa on separate split level. Rental for 6 to 18 guests. Garden, terraces with sea view and private pool, Jacuzzi, air-conditioned, Internet access. 100 m away from beach of fine white sand. Beds are made upon arrival. You can hire a cook for diners. Jet ski and boat hiring 500m away from the villa. 7 shower rooms with walk-in shower, 5 separate toilets. Modern spacious villa with a pool and ideally located for access to warm Mediterranean beaches. We had a lovely family holiday in this modern and fully equipped villa. Daniel the owners agent and handyman was there to meet us when we arrived even though we were 4 hour early. He gave us the grand tour of all the rooms and facilities and then left us to ourselves. The large kitchen and dining area comes with two large fridges and a freezer, (very handy) with plenty of utensils, pots, glasses and crockery. When we did have a small issue with the lack of hot water, Yvan the owner informed Daniel and he was there within the hour to sort the problem out. Access to the beach is via a pavement that takes you straight past a pleasant little bar on the beach with sun loungers and cocktails. Market day in Sete is on Wednesdays, it gets busy but its well worth a visit. For us the villa was exactly what we wanted and the location couldn't have been better, we only wish we could have stayed longer. enjoyed by all of our large party ages ranging from 12 to 70 years. he villa was perfect for our family vacation. The house is clean, well organized and privacy if you want it! The pool is solar heated and was comfortable to swim in. The hot tub is not hot but was nice on cloudy days. The kitchen was well equipped for us but not for the cook who was preparing meals for 14 every night. The walk to the beach was easy. The beaches are sandy and so beautiful. Our concerns were: 1. No beach towels. I wish I had known because we would have brought them. I have rented beach houses around the world and this was a first. 2. No hair dryers. I have yet to be in a hotel or vacation rental without a blow dryer. 3. No phone. If you are a foreigner, be sure that one person activates their cell for international. My suggestion to The owner would be to organize a guide to the house and the area for the guests. We had to wander to find what we needed. There was no grocery with in reasonable walking distance so a car is really necessary. Also, two towels per person would be nice especially with children. The washer and dryer were great but we did not go on vacation to do laundry. This is a place that we would return to without hesitation! First of all, we would like to thank you for your trust and we are delighted that your stay in our villa pleased you. The well being of our holiday makers is our priority and your comments allow us to improve the quality of your stays year after year. Following your recommendations, we have put at your disposal beach towels as well as hair dryers. Indeed, we do not supply telephones due to the logistic complications however, we remind you that you have free internet access and foreign tv channels. Also, it is true that you have wished to get an independent concierge service which has asked to be in charge of your welcoming and consequently, we cannot have any control of your welcoming. There are lots of shops locally and we have the chance to benefit from large streets reserved uniquely for pedestrians and bicycles along the 17 kms of the coast. We remind you that we provide 8 bicycles for your use. We are available if you have any questions or inquiries during your stay. All the team from villa Pharos thank you for your stay and hope to see you again soon. The photos do not do this property justice. It's a nice modern villa with three double bedrooms and then three seperate apartments with 1 or 2 double/twin bedrooms, own bathroom, living room and kitchen. All the apartments have a bbq as does the main villa. The facilities are great and the kitchens are really well stocked with everything you need from wine glasses to pots and pans, we coooked for our party of 16 numerous times without any problem. The outside space comfortably seated 16 as did inside the main villa. We walked to the beach restraunts with children which took 5-15 minutes depending which restaurant. The caretaker does not speak English but we managed the basics, however, if we didn't have one fluent French speaking person in our party we may have struggled with a couple of things. It really was a bargain and we would visit again. The only negatives I can say is that they didn't supply a high chair when they said they could and the cot was unusable as it was covered in sand and dirt. If you are taking a baby you would want to ask them to fix this for you. Looking at photos and the info on here we thought we were taking a risk but it paid off and was a brilliant villa and holiday. The caretaker makes progress in English every week, he can only improve as time goes by !!! Tank you pour this review and in the hope of seeing you again soon. Tout était au Top !!! Maison super bien équipée, emplacement idéal !!! très belle maison agréable, spacieuse. Nous avons passé un très agréable séjour en famille à Sète .Nous avons pu profiter des commodités de cette belle maison sans se marcher sur les pieds. Les plus: La grande pièce à vivre, les vélos, le spa , la proximité du lido, la ville de Sète,et la gentillesse et disponibilité de Daniel. House located in the district of Villeroy, between the Mediterranean and the Etang de Thau. 3 km away from Sete’s train station (postal code 34200), 34 km away from the Montpellier-Mediterranee airport and 10 km away from the spa and Thalasso centre of Balaruc-les-Bains and from the motorway exit. Golf: Golf course10 km away.